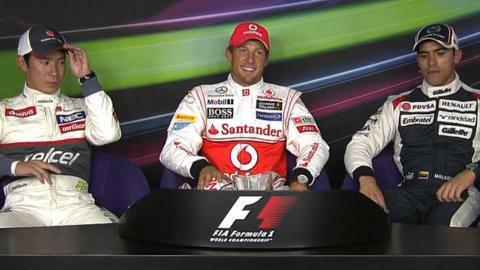 Jenson Button admitted that winning the 2012 world title is a "long shot", but insists it is still possible. The McLaren driver, on pole position for Sunday's Belgian Grand Prix, is 88 points behind championship leader Fernando Alonso of Ferrari. "A lot of people have asked can I still fight for the championship," he said. "I need to be finishing on the podium and ahead of him in every race, which is not easy given his consistency, but this is a good start." Button was in imperious form at the demanding Spa-Francorchamps circuit, qualifying 0.298 seconds quicker than Sauber's Kamui Kobayashi in second place. Williams's Pastor Maldonado is third, with Alonso only sixth. It was Button's first pole since the Monaco Grand Prix in 2009, when he was driving for Brawn. He has chosen a low-downforce set-up for his McLaren - like Alonso but unlike Button's team-mate Lewis Hamilton, who qualified eighth but will start seventh following a grid penalty for Red Bull's Mark Webber. "We're not sure whether we've got the right downforce for tomorrow," Button said. "Our straight-line speed seems pretty good, which is good for overtaking but you spend a lot of time in the [twisty] middle sector. "Possibly you can damage the tyres more with less downforce, or perhaps you can damage them with more by generating more heat. We don't know yet. "We expected the guys with higher downforce to be quicker in qualifying. So it's a nice surprise to be here. "We've done a good job today a getting the right balance in such a short period of time. "I've had bad memories in qualifying, and good here. Spa was my first qualifying in the top three in 2000, and [today] adds to the good memories." Race build-up 12:10 BST; BBC One, BBC One HD and online (video and text). Race live: 13:00; BBC One, BBC One HD, online (video and text) and BBC Radio 5 live. Highlights 19:00 BST BBC Three.